Originally uploaded by NASA’s Marshall Space Flight Center. 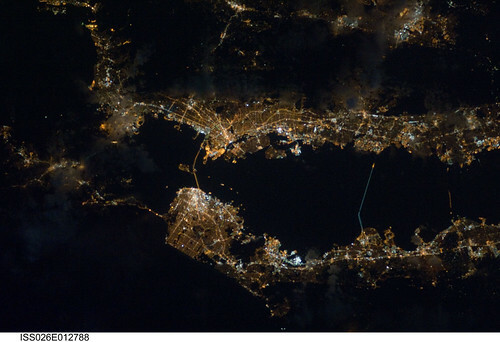 Though dark clouds limit the visibility of much of the eastern side (top of frame) of California’s Bay Area, lights expose most of the region’s highly populated areas. From 220 miles above Earth, the photo was recorded with a still camera equipped with a 180-mm lens on Dec. 26 by one of the crew members onboard the Earth-orbiting International Space Station. Man-made archipelagos near Dubai, United Arab Emirates, are featured in this image photographed by an Expedition 25 crew member on the International Space Station, flying at 220 miles above Earth. The municipality of Dubai is the largest city of the Persian Gulf emirate of the same name, and has built a global reputation for large-scale developments and architectural works. Among the most visible of these developments — particularly from the perspective of astronauts onboard the ISS — are three man-made archipelagos. 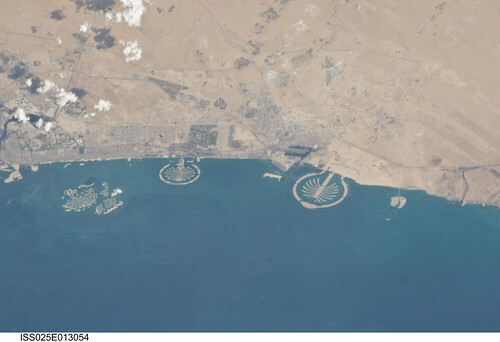 The two Palm Islands — Palm Jumeirah to the left of center, and Palm Jebel Ali, just to the right of center, appear as stylized palm trees when viewed from above. The World Islands (near left edge) evoke a rough map of the world from an air- or space-borne perspective. The Palm Jumeirah project began in 2001 and required more than 50 million cubic meters of dredged sand to raise the islands above the Persian Gulf sea level. Construction of the Palm Jumeirah islands was completed in 2006; they are now being developed for residential and commercial housing and infrastructure. Creation of the World Islands was begun in 2003 and completed in 2008, using 320 million cubic meters of sand and 37 million tons of rock for the surrounding 27 kilometer-long protective breakwater. There’s a Flickr group about Space Station Research. Please feel welcome to join! 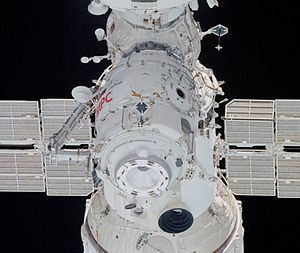 “The Mini Research Module-2, known as “Poisk,” which means “explore” in Russian, will deliver 1,800 pounds of cargo to the station. Poisk is scheduled to automatically dock to the station’s Zvezda Service Module at 9:44 a.m.
“The 8-ton module is scheduled to launch at 8:22 a.m. Nov. 10 from the Baikonur Cosmodrome in Kazakhstan. The combination docking port and airlock will ride atop a Soyuz booster rocket. The Soyuz launch will not be broadcast on NASA TV. “WASHINGTON, Oct. 11 /PRNewswire-USNewswire/ — International Space Station Expedition 20 Commander Gennady Padalka and Flight Engineer Michael Barratt landed their Soyuz TMA-14 spacecraft on the steppes of Kazakhstan Sunday, wrapping up a six-month stay. Joining them was spaceflight participant Guy Laliberte, who spent 11 days in space. “CAPE CANAVERAL, Fla., July 15 /PRNewswire-USNewswire/ — Space shuttle Endeavour and its seven-member crew launched at 6:03 p.m. EDT Wednesday from NASA’s Kennedy Space Center in Florida. The mission will deliver the final segment to the Japan Aerospace Exploration Agency‘s Kibo laboratory and a new crew member to the International Space Station. Author rjbaileyPosted on July 16, 2009 Categories SpaceTags International Space Station, NASA, Space Shuttle Endeavour, Space Shuttle programLeave a comment on Endeavour is GO! 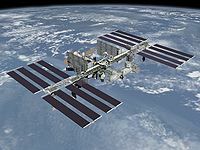 “WASHINGTON, May 4 /PRNewswire-USNewswire/ — Students from the Ronald E. McNair Discovery Learning Academy in Atlanta will participate in an out-of-this-world learning experience on Tuesday, May 5, when they receive a call from astronauts aboard the International Space Station. The downlink will air live worldwide on NASA Television and also be available on NASA’s Web site. This is the second event of its kind to be held in the state of Georgia. “HOUSTON, March 26 /PRNewswire-USNewswire/ — The 19th crew to live and work aboard the International Space Station launched into orbit Thursday morning from the Baikonur Cosmodrome, Kazakhstan, aboard a Soyuz spacecraft. NASA astronaut Michael Barratt, Russian cosmonaut Gennady Padalka, and spaceflight participant and U.S. software engineer Charles Simonyi lifted off at 6:49 a.m. CDT.